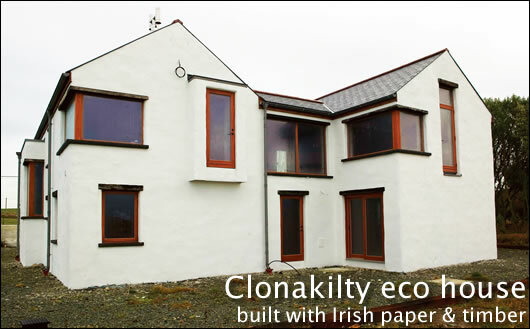 A new house in west Cork offers a green vision for the future of Irish home building: not only is it A-rated, airtight and highly energy efficient, it’s built with ecological materials that are manufactured in Ireland too. If the future of Ireland’s economy is going to be green, Cork company Ecocel is a microcosm of how it might look. Not only is the firm manufacturing in Ireland, it’s making cellulose insulation — a product that doesn’t just save energy and money when installed, but one that’s produced from recycled paper. Egan has another idea for collecting paper though — he plans to ask local schools, charities and sports clubs to save their paper and sell it to Ecocel. He’s also planning to start collecting waste paper and cardboard from the commercial park where the company’s based. Once the paper arrives at the factory, Ecocel check it for quality and consistency, then shred it, mill it and add fireproofing chemicals. It then goes into a cyclone to remove dust, then it’s bagged. 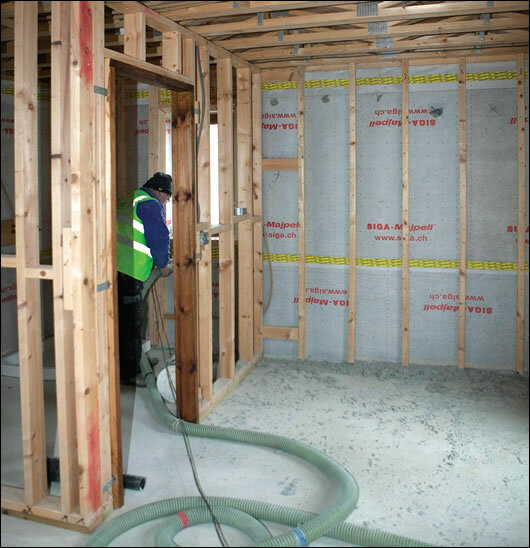 The company recently insulated a new seaside timber frame house outside Clonakilty, Co Cork, pump-filling the 200mm timber wall and roof studs with cellulose. Experienced timber framer Tim O’Donovan built the house entirely on site for Breda Cooney and Pierre Rousoux. Construct Ireland profiled O’Donovan’s own house last year — the project boasted extraordinary attention to detail and is battling it out with Jer Rynhart’s house in Wicklow (see Construct Ireland issue 4 volume 5) for the title of most airtight building in the country. But Breda and Pierre’s house isn’t far behind. Once they decided to build, Breda and Pierre started to familiarise themselves with U-values, BERs and the terminology of green building. They considered concrete and poroton (clay) blocks before choosing timber frame. To build the house, O’Donovan used Irish timber supplied by the Murray Timber Group (MTG). The company supplied laser cut, Canadian Lumber Standard (CLS) timber. CLS is a smooth timber standard that originated in Canada but is now popular worldwide. Murray Timber Group is a member of the Forestry Stewardship Council, which certifies forests that meet its criteria for sustainable management. O’Donovan also specified OSB board from Medite Smartply for the construction — Smartply is owned by Coilte, all its timber is sourced from Irish forests, and the company has full FSC chain of custody certification. 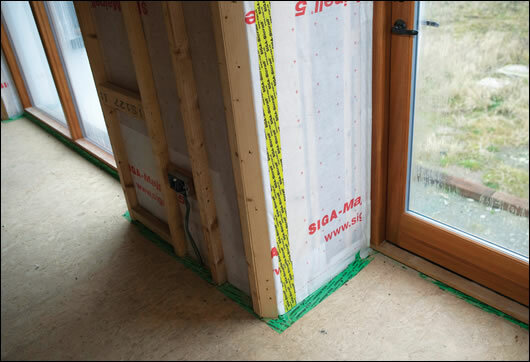 O’Donovan installed Siga wind tightness tapes and membranes on the outside of the timber frame system, with the Siga airtightness system on the inside. 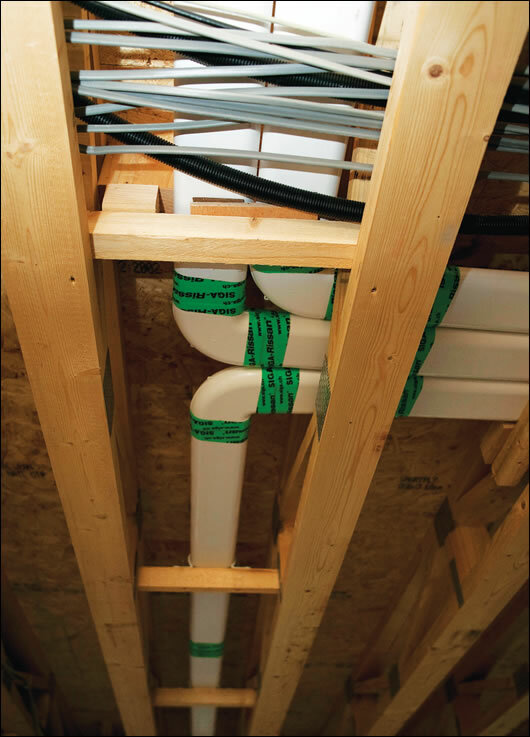 The wind tight system prevents wind penetrating from outside, while the airtight system seals the inside of the construction. “Siga sticks to everything,” he says. O’Donovan was aiming for a rather extraordinary feat — to reduce the house’s air leakage to absolutely nothing. 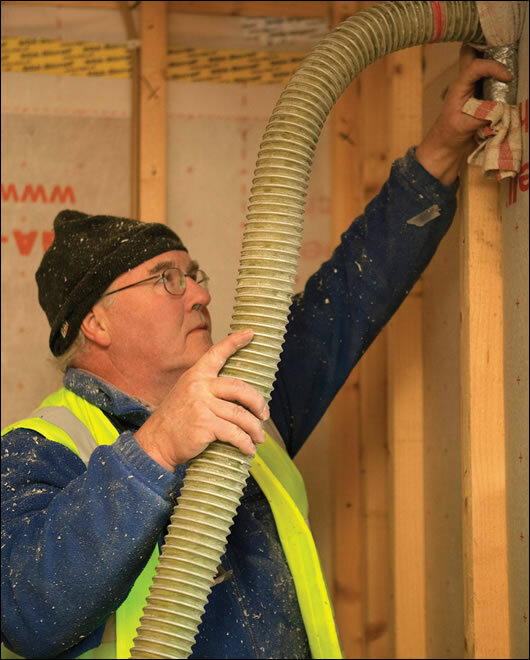 He hoped to achieve this on the last airtightness test, but it produced a result of 0.26 air changes per hour. “We checked every last bit of the envelope and it was 100%,” he says. “I put so much attention to the detail of the building.” This is still one of the best results Construct Ireland has ever seen. Most of the remaining leakage is around some sliding doors, which O’Donovan says will be adjusted. “In my experience sliding doors and sash windows just never seal, they’re just not airtight,” says Mark Shirley of 2eva.ie, who performed the test. Being so airtight, it was crucial for the house to have proper ventilation, so O’Donovan specified an Aldes Dee Fly heat recovery ventilation unit. The system has a constant airflow, which users set via a controller. 'Wet' rooms such as bathrooms and utilities have humidity-controlled extract grilles that automatically remove more air as humidity rises, allowing for a location-specific boost to the rate of ventilation. A remote control allows users to boost the speed of the central fan, and thus the overall rate of ventilation — particularly useful when cooking. Aldes provide the full HRV system, including ducting and grilles. The Dee Fly has a heat exchange efficiency of 85% according to the independent Sap Appendix Q database, but Aldes's Alex Credoz says Sap Appendix Q only u tests the efficiency of the fan and the heat exchanger rather than the whole ventilation system — and he says the higher the efficiency of the fan, the less control there is over air flow. "We offer a plug and play system where you have constant air flow fans and self-balanced extract grilles," he says. "Tiny details make the system more efficient." He says that while many supply grilles must be placed in the middle of the room to ensure adequate air distribution, Aldes's can swivel and can thus “be hidden just above the door and offer better air mixing in the room”. 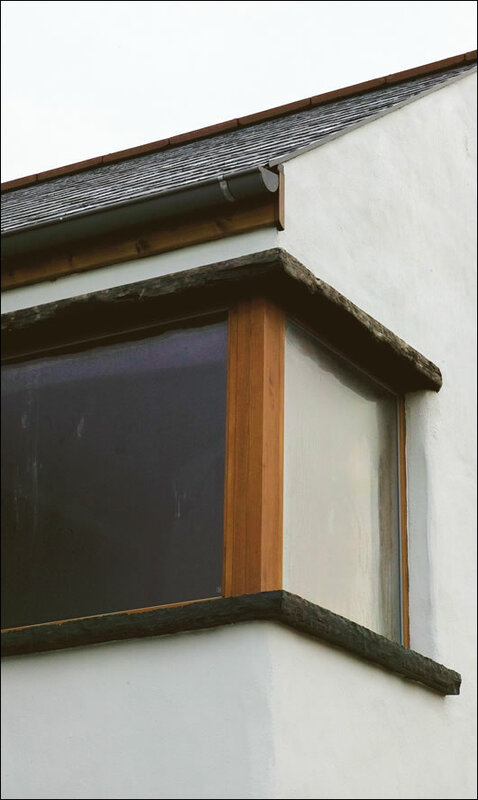 The Window & Door Store in Cork supplied the house’s Viking windows — they’re double-glazed, argon-filled and have an overall U-value of 1.4 W/m2K. Most glazing is on the south west facade, which helps to maximise solar gain. O’Donovan also installed six square metres of Gasokol TopSol solar panels, supplied by Universal Solar. Breda and Pierre had yet to decide on their main heating system as Construct Ireland went to print, but Breda expects their demand for heat to be so low she’ll happily install an oil boiler. O’Donovan installed underfloor heating pipes downstairs with a few radiators upstairs. Breda and Pierre didn’t just want an energy efficient, ecological house though — they wanted one that would sit snugly in the west Cork landscape too. “The brief was really to design a house that took advantage of the views and the context of the site and the vernacular feel of West Cork farmhouses,” says project architect Eugene O’Rea, of Platform Architecture. The dwelling is divided into two blocks sitting at angles to each other. “It’s that whole idea of a main farmhouse with outbuildings,” he says. O’Rea designed the living spaces on the first floor, with the bedrooms downstairs. This not only offers sea views from the main rooms, it helps to save energy too — warm air naturally rises, meaning it will be directed to the living spaces upstairs, which typically need to be heated to a higher temperature than bedrooms. To create a traditional look, Breda wanted soft, round finishes outside.“What we wanted to do was to blend the old with the new,” she says. A neighbour unwittingly suggested the couple’s plasterer had done a shoddy job because he hadn’t produced an even finish — but that’s exactly what the couple didn’t want. “The corners are all rounded and are rounded into the windows as well…it’s not what you’d normally expect,” Breda says. They plan to use similar finishes inside too. O’Donovan demolished an existing house on the site before building the new one — all concrete from the house was thrown into a mobile crusher, which produced concrete chips for surfaces around the house. “We had perfectly good recycled concrete that we could use, so why not use it?” he says. He installed Ecostar slates for the roof — produced in the US, the slates are made from post-industrial recycled rubber and plastic. Breda says she hired O’Donovan because he was offering to do the entire project — everything from the foundations through to fitting the kitchens. The couple are planning to move in by the end of the year — O’Donovan is currently working on the project one day a week — and she’s happy for him to take his time. Breda praises his attention to detail. “The eye for detail that he has is really good, and he really understood what we were trying to achieve,” she says. Ground floor: Strip foundation using Ecocem cement with 150mm Xtratherm rigid insulation, with 50mm Xtratherm strip around the perimeter. U-value: 0.13 W/m2K. Windows: Double-glazed timber Viking windows, argon filled, low e glass. Overall U-value: 1.4 W/m2K. Heating: 6m2 Gasokol flat plate solar thermal collectors; main heat source to be confirmed. What makes wood products so sustainable? Ecocel is an eco-friendly home insulation product made from recycled newspapers, which compares favourably with all imported alternatives.